Jewelry detail: these pics made me realize my vintage locket is most likely Ralph Lauren, judging by the RL. 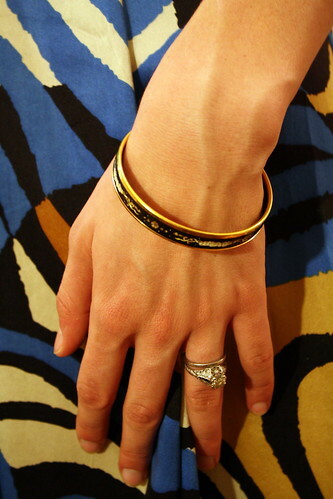 And this is a close up of the Hermes bangle I wear all the time. It was so incredibly nice and warm outside on Saturday so I busted out one of my favorite summer dresses. It makes me feel like I’m somewhere exotic when I wear it. B., a couple of our friends and I went to a bbq on an incredible roof deck in Dupont. It was dark out and we all pondered what kind of scandalous things one might see in the many surrounding hotel and apartment windows late at night – clearly we focus our mental energies on only the most appropriate and important of issues when we get together. you’re welcome and thank you too… but still working out with stomach. oh, i love your colorful dress which you look more beautiful on it. those jewelries you have are so precious. i would love to exchange link with you. i like your dress! the print is so unique! and i love those shoes so much! 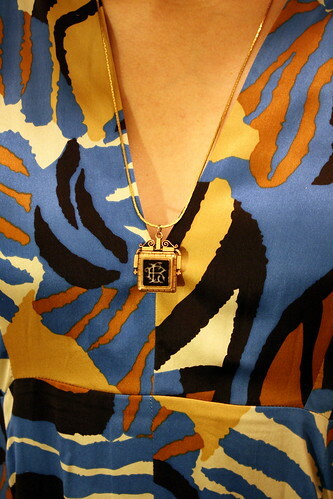 such a cute dress, and I adore your vintage locket, so cute.